Companies, led by tech giants including Apple Inc. and Facebook Inc., are snapping up more clean energy than ever, even as shifting environmental policies from the U.S. to Europe threaten the economics of renewable energy. 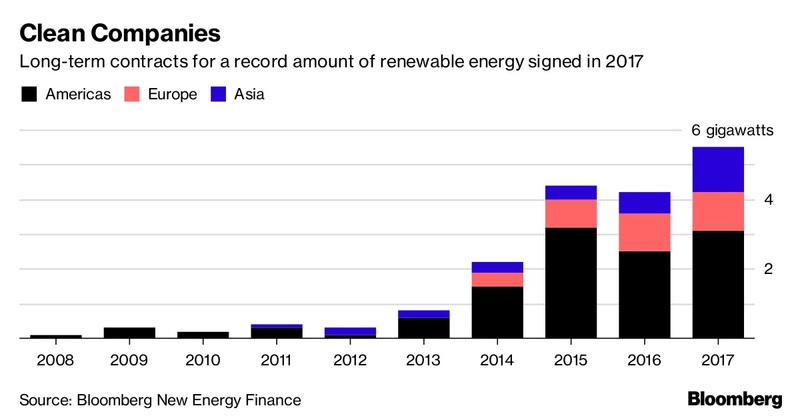 Forty-three businesses signed long-term agreements for a record 5.4 gigawatts of clean power including solar and wind worldwide last year, according to a Bloomberg New Energy Finance report. That’s up from 4.3 gigawatts in 2016 and is enough to displace at least 10 coal-fired power plants. BNEF clients can see the full report, “1H 2018 Corporate Energy Market Outlook”, on the Terminal or on web. Big Tech is signing contracts for renewables even as the largest market, the U.S., rolls back policies promoting clean energy. President Donald Trump is expected to decide soon on tariffs for solar imports. His administration is already undoing Obama-era regulations on power-plant emissions and has decided to pull the U.S. from the international Paris climate agreement. The Trump administration’s rollback of U.S. environmental policies have actually emboldened some companies to buy more clean power in a bid to fight climate change in the absence of federal policy. Alphabet Inc.’s Google and Facebook are among those that have agreed to climate pledges. Companies that have committed to buying 100 percent of their power from clean energy resources include JPMorgan Chase & Co. and Goldman Sachs Group Inc.
Apple led procurements of clean power last year with a purchase agreement for a record 200 megawatts of solar to power a data center in Reno, Nevada, according to the BNEF report. The U.S. remained the biggest market for contracts, with 57 percent of last year’s agreements signed there. Others are opening up amid interest from corporations, including Sweden, where aluminum producer Norsk Hydro ASA agreed to buy most of the output from a 650-megawatt wind farm.